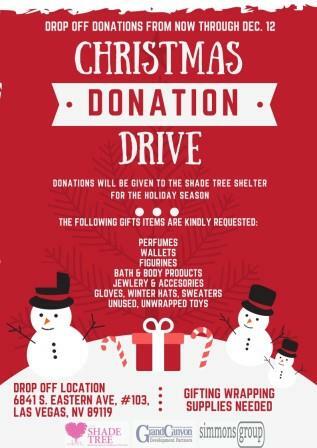 Grand Canyon Development Partners and Simmons Group will be partnering for a holiday donation drive to benefit The Shade Tree of Las Vegas, a local shelter that touches the lives of more than 6,000 women, children and their pets every year. Completely free of charge, The Shade Tree is the only 24-hour accessible shelter designed specifically to provide a safe haven to women and children in Southern Nevada. The holidays can be especially difficult for families-in-need, so the community is able to give back and make their holidays brighter by dropping off new or gently used donations to the Grand Canyon Development Partners office. Items needed include, but are not limited to: gift wrapping supplies, perfume, wallets, figurines, bath and body products, jewelry and accessories, gloves, winter hats, sweaters and unused, unwrapped toys. Items will be collected from now until Dec. 12. All donations are greatly appreciated and can be dropped off at the corporate business office located at 6841 S. Eastern Ave. #103 Las Vegas, NV 89119.